Next week McClelland Gallery and Sculpture Park have two art chats for you to attend. $5 includes a coffee and muffin at 10.30am. A walking tour on the survey sculpture trail with artists: Zoe Amor, Antonia Goodfellow and Anton McMurray. 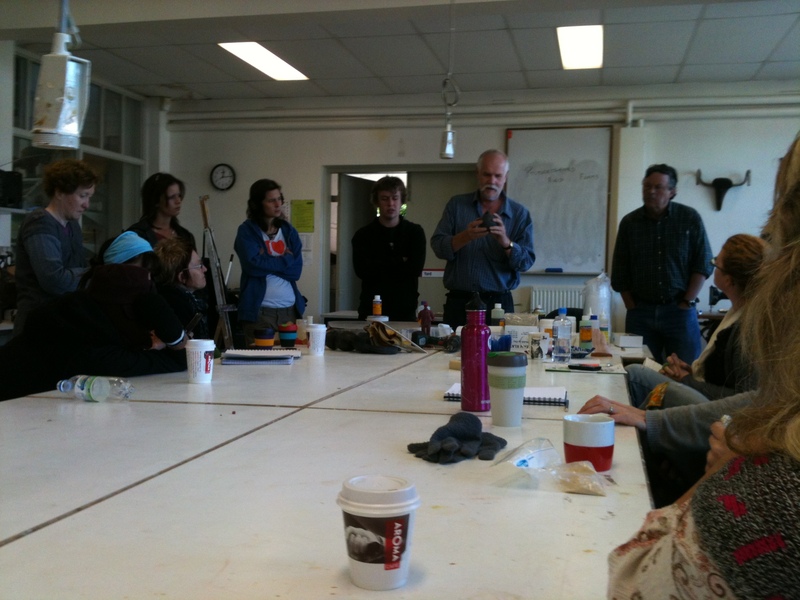 An art chat with McClelland Award Recipient 2012 Greg Johns. I hope to be at both, so will be looking for some art students and professionals to come along! It’s amazing what you can also learn when giving a workshop! Imogen at McClelland had prepared a great session for the kids and the studio was prepared with local clay from the McClelland Gallery Park dam and a table loaded with natural odds and sods from the grounds. I had a little cheat sheet with pics and story about how Boggarts are little naughty spirits or elves that inhabit the bush and forests, creating mischief and trying to frighten people. That made it a lot easier to introduce myself and other volunteers and get started. This was my first session and Imogen admitted that we had been chucked in the deep end, but with teachers, other volunteers and parents around for support I soon found everyone having a good time. We had three groups one after the other in forty minute sessions. The plan was introduction, talk about what we were going to do, then out to find some extra materials and main sticks to build their little creations on. When back inside the kids had about twenty minutes to create their little Boggarts and I walked around helping them with modelling their clay and any tips on how to build up their creations so they wouldn’t fall apart. I also helped with tips on what they could use various bits they found for and encouraged them to be creative and have fun. At the end of each session we had time for each child to talk about the little Boggart they had made, was it a boy or girl, was it a naughty or a good one and all the pieces they had put on them and what they meant. We then had just enough time to get hands washed and move the group on for the next one. As I left Imogen had all the kids say thank you which was really nice, as I had enjoyed myself too. I have since had a lovely email from her which I will put in here. Just a very short note to say thank you for all your help today! I know I threw you in at the deep end and the kids had an absolute ball! The same school will be visiting on Thursday the 23rd of August – different kids and more of them – 75 in fact! I will send out some info next week but we will run a very similar program. Thank-you all once again for showing the kids a fantastic time. As you can see we are having another session in only a couple of weeks! I at least have experience now and will not be quite as nervous when I start off. McClelland supplied a nice little lunch for us afterwards and I had a chance to walk around and take in the new sculpture exhibitions in the gallery. If you like sculpture or do it as your art form I can really recommend attending them. Two of the galleries have Vincas Jomanis, Clifford Last and Clive Stephen works. They are mostly in wood, bronze and stone and very beautiful. I liked Clifford Last’s works the best as they were very organic and curvy, the texture and colour of the wood showed and the shaped seemed to flow and move. Clive Stephen’s work is based more on a tribal theme from places like New Guinea and some of Vincas Jomanis’ work was more angular and abstract. There were some very nice drawings and paintings by these artists as well. Well worth a look in any case, apart from the distraction of all the works scattered around the park outside. All in all a really good day. The volunteering idea for me I think is a good one. It has the benefits for everyone as I had hoped, and I can only keep doing my best to keep it that way. Hopefully, more news about activities in the near future! After a challenge from Jon today, here are FIFTEEN ways to arrange two hammer heads to create a found sculpture. I have my favourite, which is kind of naughty! I am so happy that my little bronze dog has worked! There is always a risk when pouring bronze that there may be a hiccup somewhere. You can get bubbles, or the cast may crack allowing bronze to go where you don’t want it. I really was so nervous as I cracked off the mould today and washed off my little piece. This is the first bronze I have ever done so it was exciting and more than a little nerve wracking. I have no problem creating little pieces with clay, wood or even softer stones, or moulding in wax but this was all new and waiting is not something I do well – so the four days my piece was in the kiln were spent wondering and worrying. Anyway here it is for all to see! The good news is we will be doing another cast next semester so I get another go at it! Let’s see if I can come up with another artwork that I am as happy with as this little guy! 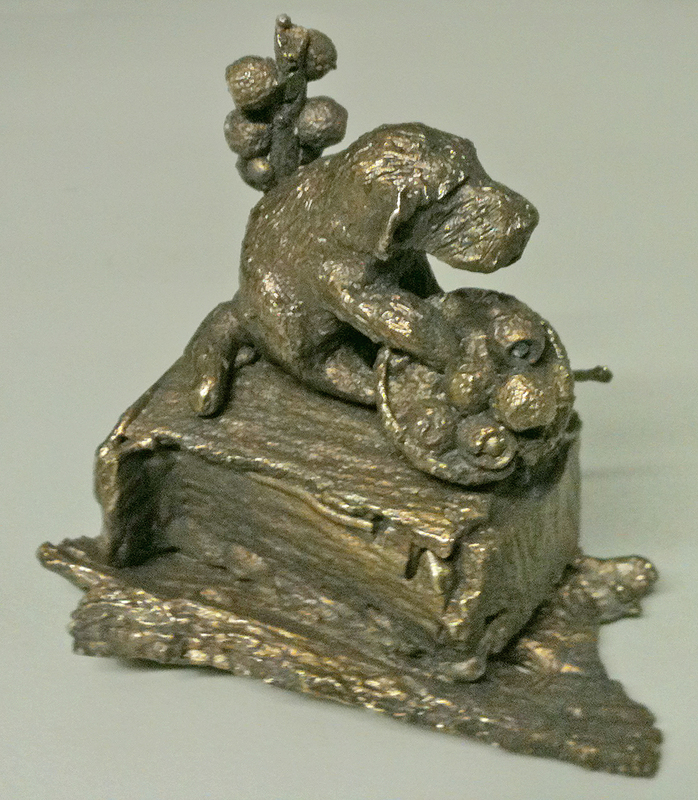 Bronze cast from original wood and wax sculpture. I have never seen bronze being poured for sculptures before so this was very interesting! The teachers doing the pour are Jon and Nathan. We were told to keep a decent distance from them for safely reasons as a pour can go wrong with bronze “exploding” or spattering a good distance as it goes into the moulds, hence the reason for all the safety gear. The little moulds which they are pouring into are made up of a plaster mix that was previously poured into plastic piping. The piping was in two sections and held together by strong tape to allow it to be pulled off the plaster before the bronze pour. Inside the plaster moulds were our sculptures. Mine was made up of a little wax component sitting on a box made of bark with small gum nuts as an addition. The little sculpture was constructed using hot glue. When the sculpture was ready it was glued to a stand made of foam and a plastic cup with a straw on it to be used as an air line to help prevent an air bubble occurring when the bronze was poured. The sculpture was then placed into the plastic piping and the plaster mix poured in around it. When the mix was air dried for a couple of weeks, the plastic cup was removed and it was placed into a kiln for all the original sculpture to be burned out leaving the moulded shape created by the plaster mix. The process of burning out all the original sculpture was one of over four days in the kiln. They were then then taken out and allowed to slowly cool off in the open air. As you can see by the multiple moulds on the ground, the kiln was stacked up with quite a few works for this pour. I am now looking forward to the plaster being broken off the bronze when it is set to reveal my little bronze sculpture all ready for me to tidy up and clean. The sculpture class this year has branched out into areas that I hadn’t even thought about before. We are experimenting with materials I haven’t touched for many years, or have no experience with at all. I am not planning on taking my career in the specific direction of sculpting, but I have dabbled in the recent past mostly for my own enjoyment and it doesn’t hurt to not only get outside your comfort zone a bit, but also know that you have skills just in case you need them. We had a visit from Steve, who has many years training and experience with various moulding and casting materials for artists. He demonstrated and explained a lot of materials that we had little exposure to and had not seen in class yet. First he told us who the suppliers are in case we need to contact them. In Australia they are Gel Chem, Barnes and Solid Solutions. Steve gave a demonstration of Dental Alga by casting a student’s hand in it. It was later filled with a solid casting material and allowed to set. Dental Alga is safe to use and breaks apart easily so the whole process isn’t too frustrating. We were told about rigid and flexible moulds. Rigid moulds do not bend and flexible ones can be made of such materials as silicon or rubber and they can allow for undercut to prevent breakage as you pull your piece out of the mould. Moulds can allow for multiple of original sculptures, they can be made of plaster bandage as well which has cut lines included so they can be pulled apart when set. These are useful when casting body parts. We had a practical demonstration of how to create a flexible mould in Dental Alginate. It was interesting that it had to be done very quickly as the material sets fast after mixing. We also saw how the Hydrastone was mixed to go into the hand cast. This material is based on gypsum and comes in a powder which is mixed with water and is very strong once set. It is up to five times stronger than normal plaster. We learned that a mould that is cast and then smashed off the casting is called a Waste Mould. We learned that a Ceramic Cavity is the name for casting things such as plates and other crockery and it is also called Slip Casting. We were reminded that the best way to dry plaster is in the fresh air and not to try to speed up the process with a heater for example, as it will only make it crack. We were given a demonstration of paint on latex and it was explained how time consuming the application is, requiring many coats to be painted on and drying time between each one. It was also explained that this material is very flexible and only has certain uses. Steve had examples of how to make up the base, frame etc for a silicon mould and had brought along several previously created versions. He even gave us pricing on materials and drew up diagrams so that it was easy to see the methods and why they were necessary. The need for scales and accurate measuring was emphasised as if your quantities are wrong it will effect setting time or stop the material from setting at all. We were also told about the health risks for materials that were a bit more hazardous. For much of the casting we were told to keep plenty of paper towel handy as keeping the work area clean is very important. Some of the materials set so fast that having an extra person to help is also very important. We were shown examples of objects in resin. Many objects can be preserved for display using this method. (even leaves) We had a practical demonstration of how to mix and pour the resin. It was pointed out that there is a lot of work done after the resin is pulled out of the cast. To get a professional finish cutting and polishing is involved. Other materials covered were Polyurethane which can take special colours to make the casts more exciting to look at. Clean Clay which is good for modelling as it isn’t as dry as most other clays once set, Scalpie which can be dried in an oven and is good for modelling and sculpting and a “Wound Kit” which anyone who likes special effects would love as it creates the most horrible looking special effects wounds for the human body. The session was quite intense with information and went overtime but Steve was very informative and entertaining so I enjoyed the lesson and demonstration very much. I have more detailed notes in my journal for future reference including diagrams, so if I need the information it’s there ready to go.